Hi everyone, sorry it's been quiet here again for the last while. I've been mega busy with work and also working on a new website design. But, thankfully, I can now announce that the new site is up and running! It's been a LOT of work - you keep thinking of new things that you need to do, or small changes and it seems never ending. I doubt it's ever really finished of course. I moved from my old provider because they just weren't giving me the facilities I needed and I have to say I'm delighted with the new provider ... fab new features, great order management and some lovely new features such as being able to offer discount codes etc. So, apologies for my lack of posts ... here's a screenshot of the front page but, please, do have a look at the site and tell me what you think. Oh and if you see anything that I need to change, drop me a line here ... it's great to have new eyes looking at the thing I've been working on for so long! 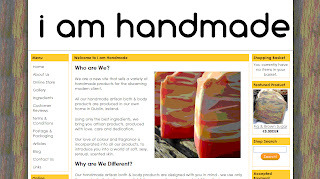 Hope you like the new site ... click on http://www.iamhandmade.com/ and see what you think. Congrats! Looks great! Lots of great info and easy on the eye. 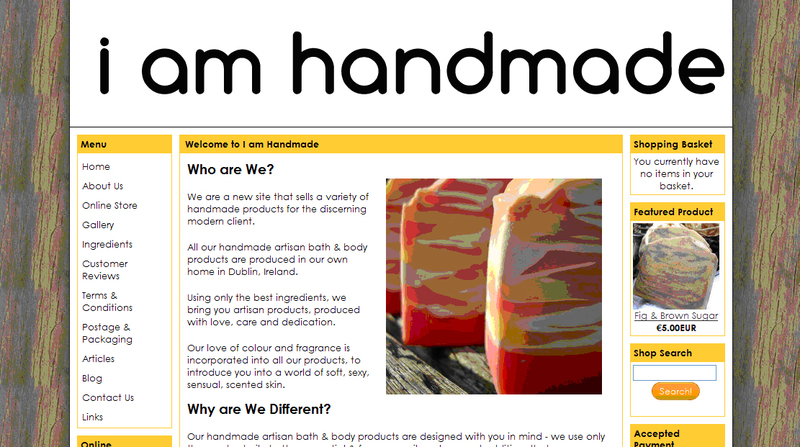 One thing, when I clicked on "The Making of a Handmade Soap - Laundry Day" article, there were no pictures visible. Very very well done. Easy to navigate . Love the history about your soap making and descriptions of ingredients. The revolving soap pics are gorgeous ! Ruth - yep, I've been meaning to puload the pics, I ran out of space on the trial version I had and had to wait, I'll be adding them this weekend. Thanks so much for your help with this, a new set of eyes is always useful! Celene, that is one fabulous website, well done you have worked soooo hard. I love the pictures and the information is brilliant. I love it! !